Read more about a 1948 move. A glass on a counter during the move, "not a drop of water spilled." Note by Sharla (Sitzman) Cerra: I talked with Delores on March 25, 2015 in order to check a fact for an article. 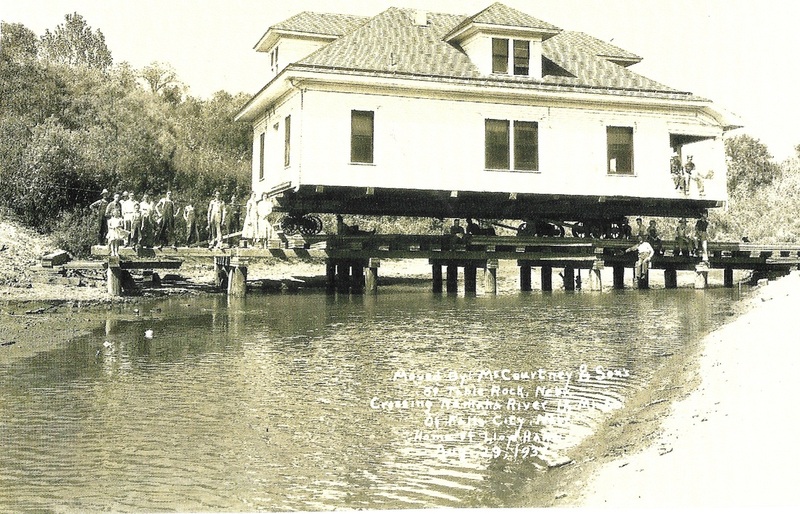 Ray Daniel of Pawnee City had talked of his house being moved by Charlie McCourtney in 1948. I calculated that Charlie was 79 years old at the time and wondered whether it might instead have been one of his sons. "Would Charlie have been out there moving a house at that age?" I asked. "Oh yeah," she said. And she told me some more. I wrote it down, and this is it. I also asked to come visit. "Oh sure," she said, "Just call to make sure I'm home." So, more to come. 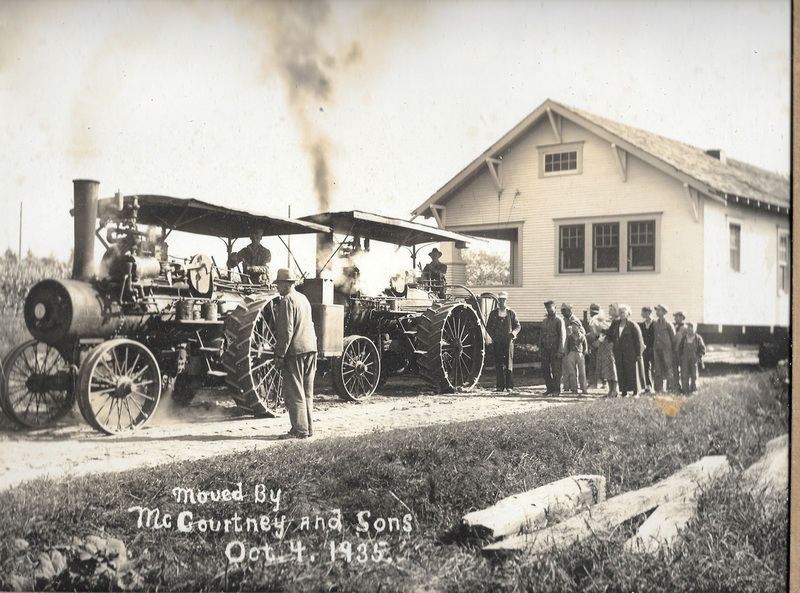 See fantastic pictures of McCourtneys moving houses, a church, and a grain bin. McCourtney and sons moved everything. 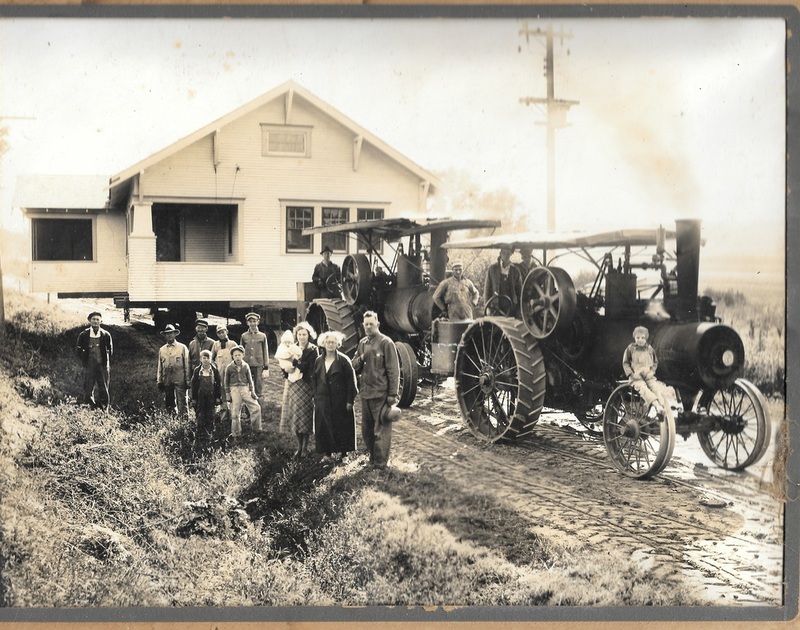 They moved houses, churches, barns, a grain mill, put a ferry boat in the river after it was built, and also moved a great big generator for a power plant in Brownville. I mentioned the picture of the bridge that Charlie McCourtney built across the Nemaha River to get a house across. Delores of course knew the picture. She said, "I’m that little girl standing there on that plank." And there she is. On the left of the picture, she stands on a plank, the skirt of her dress floating the in the breeze. This is Photo 583. On the back it says, "“McCourtneys made own bridge over the Nemaha south of Falls City. [Cabled?] it up and down the bank.” The annotation on the face of the photograph is difficult to read. It does identify the owners of the home but is mostly illegible. Home of Lloyd A...? The moving date was August of 1930 something. Of the picture, Delores also said, "Grandpa was there, my mom, my dad. Gary Harris’s dad worked for Grandpa, Jem Harris, he’s in that picture. Lester was his name but they never called him that.” Quite a number of other people were there -- seated on the porch, under the house, on the bridge. I was told a story last weekend about this particular event. Everyone watched McCourtneys building that bridge, and they REALLY wanted to see him bring the house across. The afternoon that he finished the bridge, Charlie told them to come out the next morning and watch. The next morning, people showed up, and the house was already across. He had moved it the night before. He hadn't wanted to have people underfoot. There is Charlie in the large group of people on the left. He is the person on the far right of that group. I mentioned the two photos of a house being pulled with many people standing around. I’d heard it was her grandpa Charlie McCourtney's own house. “It was,” she said. “It came from Lewiston. A lot of those kids in that picture were Rottman kids. Charlie Binder owns it right now, it’s sitting there empty.” The house is a little way west of Table Rock. Go straight west on the south side of town. Don’t take the road to Pawnee, keep going straight. It’s the second house on the left hand side. There’s three houses there, and it’s the one in the middle. Not within town limits. One time they were moving a house that was full of black snakes. My dad hated snakes. 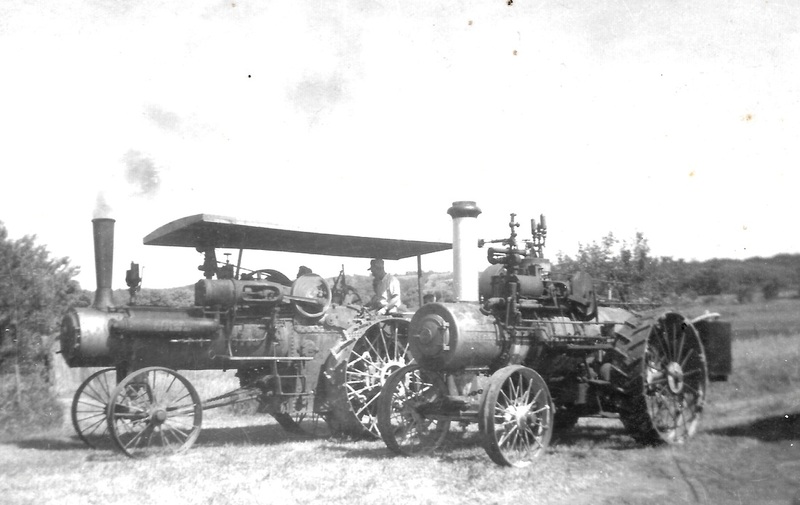 When they were raising a house up, Grandpa would yell “OOOP!” – up -- and everyone would pump a jack at the same time. Dad would always look first before he grabbed a jack. He was not going to go OOOP if there was a snake there.